Get both the book and DVD of LOST CITIES OF THE SOUTHWEST With David Hatcher Childress. Popular Lost Cities author David Hatcher Childress discusses a hollow mountain with a billion dollars of gold bars hidden deep inside it, as well as tales of Egyptian catacombs in the Grand Canyon. Childress then presents evidence of mummified giants and weird tunnels in Death Valley, plus he discusses the mysterious remains of ancient dwellers alongside lakes that dried up tens of thousands of years ago. He finishes with a discussion of UFOs, Tesla Technology and obelisks. 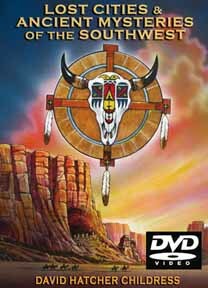 LOST CITIES OF THE SOUTHWEST BOOK AND DVD SET. 576 Page, 6x9 Paperback Book plus 87 Minute DVD in Box.